We offer a wide assortment of Pit Pot Annealing Furnaces, which are heated electrically with a heat controller. These products are used for annealing ferrous and non-ferrous metals. The pot is made by using dished bottom and modern mechanism. Our Pit pot annealing furnaces include Pit Pot Annealing Furnace. Our company manufactures a qualitative range of Pit Pot Annealing Furnaces, which have an automatic heat controller. In these products the pot is manufactured from dished bottom. 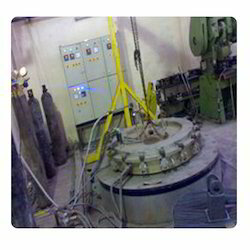 We offer such kinds of pit pot annealing furnaces that are using for higher charged output. Our organization designed products using advanced technologies and various important features in them. Looking for Pit Pot Annealing Furnace ?